12 "Memorial Services for Karlin Flory"
Harold Steven Rogers is chairman of the African-American Studies Department at Olive-Harvey College, one of the City Colleges of Chicago. He is married to Ayelet Haran, a Jewish medical student from Yemen. 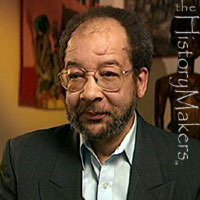 Harold Rogers was born on December 25, 1942, in Cleveland. He attended John Adams High School in Cleveland before completing a B.A. at Kent State University in 1967. Rogers went on to study at the University of Chicago and earned his M.A. in 1973. Rogers began his career in education at Antioch College, where he taught in the early 1970s. In 1973, he joined the faculty of the City Colleges of Chicago, where he has served as the chairman of the African American Studies Department for Olive-Harvey College since 1980. At the conference, Harold Rogers of the Coalition of Black Trade Unionists and African Agenda was selected to go on the National Steering Committee. Throughout his life, Rogers has been active politically. He served as a labor adviser for the state of Illinois for a number of years. And from 1987 to 1992, he worked as the district administrator for Congressman Charles Hayes. Rogers has been involved as well in numerous progressive organizations such as the Black Panther Party, the NAACP and Operation PUSH. He has served as an executive board member of the Coalition of Black Trade Unionists since 1975. From 1972 to 1993, he was the Chicago spokesperson for the African National Congress of South Africa. He was also instrumental in bringing Nelson Mandela to Chicago in 1993 and helped raise funds for Mandela's election the following April. Rogers participated in the U.S. delegation to South Africa's first democratic elections in 1994. His areas of expertise include global trade and economics, multiculturalism in education, African history and African American history. Rogers is a much sought-after speaker and participant in international conferences, congressional panels and university symposia. Recognized nationally for his gifts as an educator, Rogers has been president of Black Faculty in Higher Education since 1980, a member of President Bill Clinton's Committee on Higher Education, and a National Advisory Board member for the W.E.B. DuBois Foundation since 1990. And he has presided over the African American Studies Program since its inception in 1980. Harold Rogers, Editor of African Agenda was named as a sponsor of the Communist Party USA dominated National Anti-Imperialist Conference in Solidarity With African Liberation held at Dunbar Vocational High School, Martin Luther King Drive, Chicago, October 19 to 21 1973. Linda Appelhans, Margaret Appelhans, Arnold Becchetti, Leon Beverly, Richard Criley, Reverend Martin Deppe, Ishmael Flory, Frances Gabow, Ben Green, Bill Hampton, FatherJohn Hill, Mrs. Christine Johnson, Jack Kling, Attorney Max Maiman, Margaret Palmer, John Pappademos, Ted Pearson, A. A. Rayner, Jr., Harold Rogers, Norman Roth, Attorney Irving Steinberg, Gil Terry, Robbylee Terry, Charles Wilson and Sylvia Woods. Prexy Nesbitt, Harold Rogers and Otis Cunningham, together edited the Chicago-based newsletter African Agenda. Prexy Nesbitt, Harold Rogers, Linda Rae Murray, Scottie Ray and Otis Cunningham put out a newsletter for seven years called the African-American Agenda. In the late 1970s Rogers served on a "Citizen's Committee" supporting Timuel Black's unsuccessful campaign for State Representative in the 22nd District. Circa late 1982, members of the Citizens Committee/Harold Washington for Mayor of Chicago (in formation) included Harold Rogers. "Memorial Services for Karlin Flory"
In an article about the 1985 memorial service for Karlin Flory, son of "Ishmael Flory, former chairman of the Illinois District of the Communist Party USA, and the late Eloise Boone", he was identified as having been in "many activities for peace and equality" including protests at the South African Consulate, was a "Daily World supporter" who circulated the paper "in the early days of Operation Breadbasket, which later became Operation PUSH". Rev. William Hogan - Clergy and Laity Concerned. Later publicly identified as a member of the CPUSA. In 2000, Harold Rogers served on the welcoming committee for the Chicago Memorial Service for Richard Criley, a long-time activist with the Communist Party USA and a leader of the Chicago Committee to Defend the Bill of Rights. Honoring Committee members included Harold Rogers . This page was last modified on 11 January 2017, at 04:06.